I would definitely recommend the Marriot Indy South to friends. I hope we will stay there again. The staff was friendly and the facility was clean and well kept. 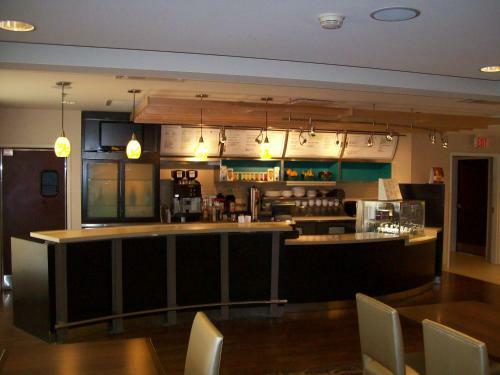 The hotel was clean, well maintained and near a varied group of restaurants and stores. I wish Marriott would provide complimentary breakfasts as other hotels do. We had a medical reason to stay in Indy for Appts. at I. U. Med Center. The entire staff was very courteous and friendly. We were greeted with smiles and hello's from all the employees making us feel we were special guests. We have a December appointment and will likely stay again. Very friendly staff-desk clerk, maid, custodian. No complaint-would like to suggest additional grab bar in the shower on the long wall. Overall, I would stay there again for sure. Exactly what I needed. Loved the beds and lots of pillows. It was very clean and nice. It did not have any vending but a little shop by the front desk, very expensive. 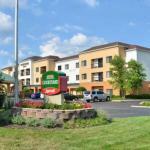 The 83-room Courtyard Indianapolis South is a business-focused hotel on the suburban south side of Indianapolis. The three-story, non-smoking property has been renovated and has facilities equally suited to the leisure traveler. There are two meeting rooms available for business or social functions. The larger can accommodate 40 guests. Items included with the room rate are high-speed Internet access, local telephone calls, a morning newspaper, parking and coffee available in the lobby 24/7. The hotel is four miles from Valle Vista Golf Club and a short drive from downtown Indianapolis. Nearby attractions include shopping at Greenwood Park Mall, the Indiana Convention Center, Lucas Oil Stadium, Indianapolis Zoo, Children's Museum of Indianapolis and the Indianapolis Motor Speedway. All the rooms, and six suites, have a large work desk with ergonomic chair and high-speed Internet access, television with cable movie and news channels, pullout sofa bed, alarm clock, tea and coffee making facilities, iron and ironing board, hairdryer and telephone with voicemail. This hotel has an indoor swimming pool, whirlpool and a fitness center. The Courtyard Café only serves breakfast but there are several restaurants nearby including a Carrabba's Italian Grill, Bob Evans, Cheeseburger in Paradise, Cracker Barrel and a Texas Roadhouse. The 24-hour front desk has safe deposit boxes, information on area events and attractions and a list of restaurants that will deliver to the hotel. Other amenities include a business library, coin-operated laundry, valet dry-cleaning and vending machines. This Courtyard was enjoyed by many former guests who stay they will use this hotel again. Items they enjoyed most were the landscaped grounds, affordable rates and the clean and comfortable rooms. There were complements for the employees who were friendly and efficient. Both the business library and the 24-hour on-site The Market were appreciated by those who needed to work or wanted a snack in the middle of the night.